This group is made up of Cal State Los Angeles Alumni, students, family & friends. Come join us for this annual event. Stay posted for our next event. 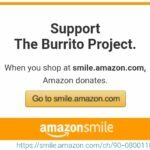 The Burrito Project – Cal State Los Angeles has been serving the homeless of Los Angeles since 2015.